One time when I used to be in agony after showering because of my severely crusted psoriasis, my new medical adviser who turned out to be my only trusted adviser, advised that I should cut out dairy as much as possible from my diet. At the time I listened but didn’t pay full attention. I did stop drinking milk but I continued to eat spreadable butter. If your psoriasis is in terrible shape then this recipe is a perfect substitute for dairy butter. Dairy is an inflammatory food so cut it out until your psoriasis looks and feels better. 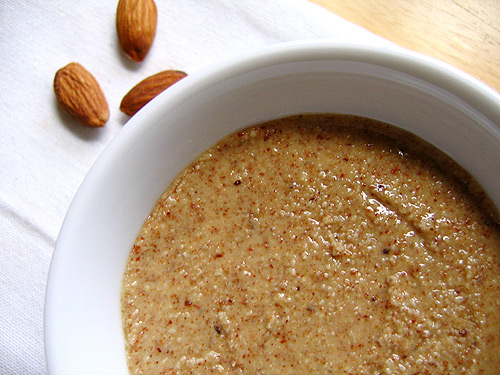 Place almonds in a food processor or high-speed blender. Process until a smooth, fine consistency (this is almond meal, if you stop at this point). Add in the macadamia nut oil and continue to process until the mixture forms a buttery, soft solid.